The late afternoon and early evening hours can be some of the most difficult times of the day for seniors living with Alzheimer’s or dementia. Many symptoms—such as agitation, restless behavior, and confusion—associated with these conditions begin to worsen, which is known as sundowning. Family caregivers can use the following tips to manage sundowning and enhance their aging loved one’s quality of life. Fatigue resulting from lack of sleep at night and inactivity during the day is one of the top triggers associated with sundowning. You should help your loved one stay active each day. Go for a simple walk together around the neighborhood, enroll him or her in a dancing course, go to the gym together, or participate in another activity that will raise his or her heart rate and energy levels. Staying active boosts mental, physical, and emotional health, alleviating feelings of confusion and agitation. 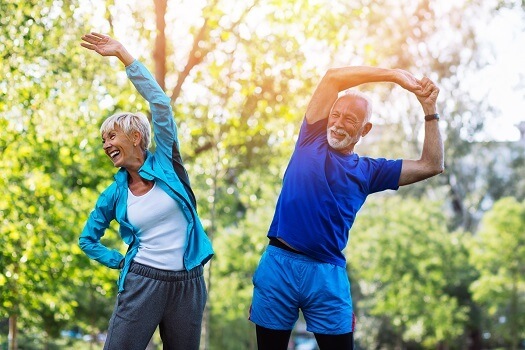 Make sure your loved one doesn’t exercise too close to bedtime, as it could make it difficult to sleep through the night, leading to a slower metabolism and sundowning problems. Establish a routine and designate the typical sundowning hours as quiet time. During these hours, you can play soft music, read a book to your parent, or focus on other relaxing activities. Instead of reading inside the home, take your loved one outside and read one of his or her favorite stories aloud. Exposure to sunlight could reset your loved one’s body clock and prevent the symptoms associated with sundowning from getting worse. If it’s not too late in the day, encouraging your loved one to take a nap during quiet time may help you control sundowning and prevent irate behavior. However, your loved one should avoid naps within four hours of his or her normal bedtime. If your loved one’s sundowning is due to dementia or Alzheimer’s, he or she may need a higher level of care than a family member can provide. Living with a serious health condition can make it challenging for seniors to age in place. However, they can maintain a higher quality of life with the help of professional live-in care. Montgomery, AL, seniors can benefit from assistance with meal prep, bathing, transportation to the doctor’s office, medication reminders, and much more. Although it’s good for seniors to remain socially and physically active, challenging activities could lead to agitation. Therefore, you should simplify your loved one’s activities. While activities and social gatherings should still provide stimulation, they shouldn’t be difficult or frightening, because these are triggers that could lead to negative behavior. Track your loved one’s behavior and learn what his or her triggers are to minimize stressful situations and make the environment more comfortable. When tracking the triggers, note which activities and environmental changes make the behaviors worsen. Sundowning can be one of the most challenging aspects of aging, particularly for elderly people with dementia or Alzheimer’s disease. Seniors can face a variety of challenges as they age, many of which can be mitigated with the help of professional in-home caregivers who provide high-quality senior home care. Montgomery, AL, families trust Home Care Assistance to help their elderly loved ones age in place safely and comfortably. Reach out to us at Home Care Assistance if you need compassionate, professional care for your loved one. It can be challenging for family caregivers to know how to manage their loved ones’ physical and cognitive needs, and professional caregivers can be a valuable resource. Not every senior has the same care needs, which means they don’t all need the same type of home care. Montgomery, AL, families can rely on Home Care Assistance to provide individualized care plans to meet your elderly loved one’s unique care needs. Our holistic Balanced Care Method was designed to help seniors focus on healthy lifestyle habits such as eating nutritious foods, exercising regularly, and maintaining strong social ties, and our Cognitive Therapeutics Method offers mentally stimulating activities that can stave off cognitive decline and delay the onset of dementia. Home Care Assistance will work with you to customize a care plan that’s just right for your loved one’s needs. Call us today at (334) 593-3988 to discuss how we can give you the peace of mind that comes from knowing your loved one is being cared for with professionalism and compassion.